Whether you’re training for your first 5K or your ninth marathon, these awesome running apps will motivate you through every mile and help you crush your goals on race day. Apart from letting you track your different workouts like hiking, jogging, they even work as a brilliant coach. Based on your goal, you can personalize the running app to get the most out of your every run. Ready to jump over to find the most suitable runner app for your iPhone? Let us help you with choosing the right one! After trying plethora of running apps on the health & fitness section at the App Store, we stumbled upon Running: Run for Weight Loss! 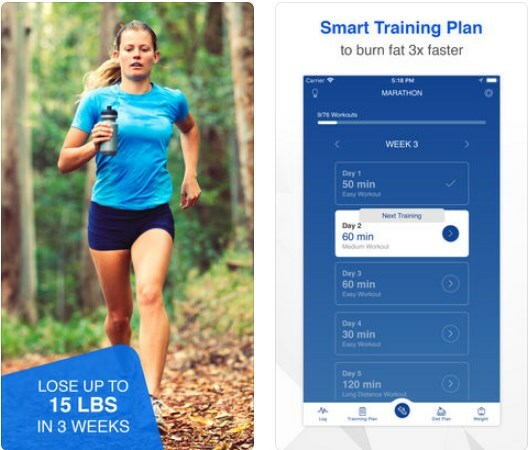 This is a running app designed to track and improve your running sessions, keep you motivated and give you a helping hand in your weight loss journey. This app won’t bother you with tons of useless features (which is a trend in majority of the running apps we’ve tried), will effectively track your runs, give you multiple training plans you can choose from, and at the same time help you with your nutrition. Running: Run for Weight Loss is a straight forward running app. Without filler features, only the ones you really need, like GPS tracking, pace and time tracking, sprints planning, and actually achievable training plans for beginners and even experienced runners. The app is free for downloading but it comes with a monthly subscription fee of 8.99 USD which is a fair price for all the features it offers. If you want to start improving your health and fitness or finally achieve your ideal weight goal, you can find and download the Running: Run for Weight Loss app at the App Store today.